A team of international scientists studying a series of hominin remains that date back some 1.8 million years, have concluded that the fossils. although showing a degree of variation, do all represent a single human species. The team’s findings could have far-reaching implications for the accepted view of the evolutionary human family tree. The fossils come from Dmanisi, a site in southern Georgia that has provided an extensive amount of early human fossil material, documenting the earliest migrations of hominins into Eurasia. The scientists led by David Lordkipanidze, a palaeoanthropologist at the Georgian National Museum (Tbilisi), have spent eight years studying the various fossil bones, many of them fragmentary but their research has amassed enough evidence to suggest a re-writing of the Homo genus. The paucity of the global fossil record for humans has left scientists with a large number of gaps in the human family tree. These species currently recognised as distinct members of the Homo genus, the likes of Homo erectus, Homo ergaster and Homo habilis may represent variation amongst members of a single, evolving lineage of humans. Put into simple terms, people look different from each other today, although they are all members of a single species (H. sapiens), so did early hominins look different from one another? The wide variation seen in the fossil bones could perhaps have led scientists to establish a number of species, when perhaps, the fossils represent a single human form. Skulls and jaws from the site in Georgia. The picture above shows some of the distinct differences between hominin fossils excavated from the Dmanisi location. The skull on the left for example, has a much broader face than the skull on the right, the cheekbones are more pronounced, the brow ridges are more defined and prominent when compared to the specimen on the far right. One of the jawbones (to the left of the picture), is significantly deeper than the specimen adjacent to it. This is the conclusion drawn by the research team led by David Lordkipanidze and reported in the academic publication, “Science”. A hominin cranium excavated in 2005, a fossil referred to as “skull 5” or more specifically (D4500) and described as being “the world’s first completely preserved adult hominid skull”, when combined with a fossilised mandible (jawbone) found at the same location (D2600), provided the key evidence that led to the simplified human evolution theory. This skull was dissimilar to other human remains found at the dig site, it had a number of primitive features such as a long ape-like face, large teeth, a much smaller braincase and a more substantial lower jaw. Together D4500 and D2600 represent the best example yet found of an adult hominin skull from the early Pleistocene epoch. The fossil haul from the Dmanisi site, which now comprises five crania, provides direct evidence of wide morphological variance amongst early Pleistocene hominids. The Dmanisi fossils have permitted the research team to study the physical traits of Homo genus members that apparently lived at the same location and at approximately the same time. The small braincase, as indicated by D4500 at approximately 546 cubic centimetres is only about 10% bigger than the average braincase size found in extant Western Lowland Gorillas (Gorilla gorilla). These primitive characteristics found amongst other hominin remains that show more “human-like” anatomical traits suggests that rather than types of human species, there could have been just a single, evolving lineage of early humans. The scientists have concluded that the differences between these fossils were no more pronounced than the differences between any given five members of our own species H. sapiens or from five chimpanzees. Such morphological differences had been used as the basis to establish new species in the human evolutionary family tree. For example, the hominin fossils from Dmanisi, evidence of the earliest Europeans, had been assigned to the new species of H. georgicus. If this new hypothesis becomes the accepted norm, then fossils assigned to the likes of H. ergaster may have to be re-examined. The very first hominins evolved in Africa, it is only in strata less than two million years old that palaeoanthropologists start to find evidence of a migration of early humans out of Africa into Europe and Asia. This first phase of human migration out of their ancestral home coincides with a period of dramatic climate change. There was an extensive period of global cooling. Many of the apex, mammalian predators that had existed in North Africa became extinct and it has been proposed that the lack of competition for meat that hominids now faced help to drive the migrations into Europe and beyond. The further north (or south) one travels, the greater the contrast between seasons. 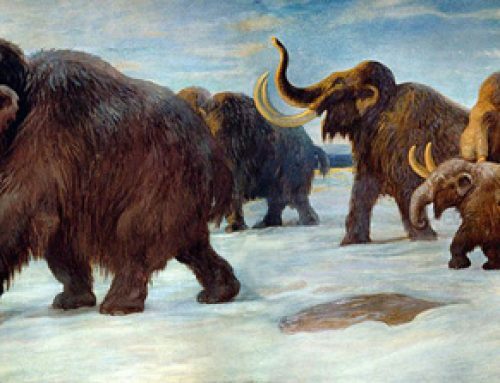 If the world cooled and mankind’s homelands of Africa grew colder, than this in conjunction with the absence of other animal competitors could have helped fuel the movements north. After all, if Africa was colder than early hominins would have had to adapt to the new climate, predisposing them to being able to cope better with colder climates at more northerly latitudes. “This recently published paper provides a new perspective on the evolution of our own species. The fossil record of early hominins and evidence for their potential migration out of Africa is very poor and much more research is needed in this area. Perhaps, in future, scientists will not use species definition to distinguish different forms of ancient human but rely on analysis of stone tool use to establish a range of different progressions in technology to chart the evolution of the human population as we know it today. Post cranium elements found amongst the medieval ruins of a castle that marks the Dmanisi dig site suggest that the Dmanisi hominins were shorter than modern humans, but they were fully upright bipeds with leg bones capable of efficient locomotion. These traits help distinguish these fossils from much earlier material still attributed to the Australopithecus genus. Australopithecines are believed the ancestors of the Homo genus. Okay i am going to say that i don’t believe in evolution. there is not enough evidence for me. and has anyone considered that maybe the reason that nobody has found 2 of the same neanderthals is because that there is no such thing as them. look up nefiliam.